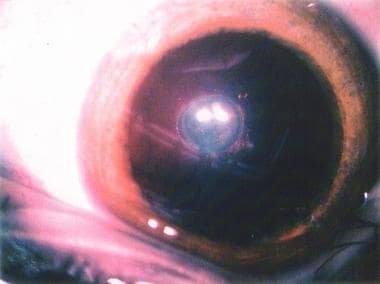 A posterior polar cataract is a round, discoid, opaque mass (see the image below) that is composed of malformed and distorted lens fibers located in the central posterior part of the lens. This location is its most significant feature, in addition to its proximity to and possible adherence with the posterior capsule. Moreover, the capsule itself may be weakened. As such, posterior polar cataract removal is a challenge to the surgeon because of its adherence to or the associated weakness of the posterior capsule. The posterior polar cataract is seen as a dense discoid opacity. The central fibrous mass consists of degenerated lens fibers surrounded by several small globular vacuoles containing what appears as a refractile substance as well as some lens degenerative fiber material. Posterior polar cataract, a distinctive subtype of lens opacity, presents as an area of degenerative and malformed lens fibers that form an opacity in the central posterior subcapsular area of the lens. Often, this opacity is adherent to the lens capsule, thereby making uncomplicated surgical removal problematic. Posterior polar cataract surgery is associated with an increased incidence of rupture of the posterior capsule. Only in recent times have the advances in control of fluidics and aspiration during phacoemulsification prompted various approaches to meet this surgical challenge. The histologic changes of the malformed lens fibers are now recognized to be associated with an adherence of these degenerative lens fibers to an area of the weakened posterior capsule. Therefore, the surgical approach must be aimed at reducing the stress on the weakened posterior capsule. For this reason, various approaches have been suggested, including limited hydrodissection, viscodissection, and posterior capsulorrhexis. Still, the reported rate of capsular rupture in the procedure is too high, sometimes 25% or more. The surgical significance of a posterior subcapsular cataract is an association with and an adhesion of the lens opacity to the posterior capsule immediately subjacent to it. The incidence of capsular tears in this subtype of cataract surgery can approach an unacceptably high percentage. Some surgeons find that the tears occur most often during cortical aspiration. The goal during posterior polar cataract surgery is to remove the opacity without rupturing the posterior capsule. This can be accomplished by decreasing stress on the posterior capsule during all phases of the surgery. Several surgical solutions and approaches have been proposed, but a technique for uncomplicated and successful posterior polar cataract extraction continues to remain challenging and problematic. The occurrence of posterior polar cataracts is rare; in fact, little is published on the specific incidence of posterior polar cataracts. Further, no standardized subtype specific study on this type of cataract has been conducted. In the Framingham Eye Study, little prevalence data for posterior polar cataracts are presented. However, it is well accepted that this is an infrequently encountered form of cataract and that the prevalence is very low. When seen, it is often as an inherited trait and is present in several members of the same family. A posterior subcapsular cataract is a distinctive, often very sharply demarcated opacity, discoid in shape and adjacent and merging with the posterior capsule. This cataract represents degenerative lens fibers that have developed abnormally. The lens fibers are surrounded by globular structures that contain a highly refractile material. A weakness of and adhesion to the posterior capsule immediately subjacent to the area of cataract is also associated with this type of cataract. Genetic analysis by Addison and colleagues, as well as by Burdon and colleagues, however, has focused attention on a mutation on the PITX3 gene. [14, 15] This gene was found to control the development of the anterior segment of the eye. The duplication of the 17 base pairs in this gene apparently alters the normal development of the anterior segment, leading to a posterior polar cataract. The exact mechanism through which this pathology is produced remains unclear. Recent advances in genomics techniques, such as single-nucleotide polymorphism (SNP) and microsatellite markers, have led to an increased understanding of the mechanism. A specific example, relating to the formation of posterior polar cataract, is detailed in a report from Berry et al. This report describes a pedigree, comprising 4 generations of a family, with more than 6 members diagnosed with posterior polar cataract after full eye examinations at the Moorefields Eye Hospital cataract clinic. Further, a genome-wide linkage was then performed by single-nucleotide polymorphism and microsatellite markers. An autosomal dominant base pair deletion (542delC) mutation was noted in the homeobox of gene PITX3 in 10q. This is one of the transcription factors critical for normal lens induction and development. The authors found this base pair to co-segregate with all the affected family members with posterior polar cataract. Mutations to alpha-B crystallin, a small heat shock protein encoded by the CRYAB gene, have also been linked to the development of posterior polar cataracts. One such mutation of alpha-B crystallin is a missense mutation that changes proline 20 to arginine (P20R). [17, 18] Normally, alpha-B crystallin helps inhibit stress-induced apoptosis. However, in human lens epithelial cells, this mutation results in diminished-apoptotic activity, providing a potential mechanism by which posterior polar cataracts develop. The autosomal-dominant nature of this allele is described in a five-generation pedigree report, with the mutation found in all members with posterior polar cataracts and not found in the 10 unaffected members. Other CRYAB mutations, D109H and R120G, have also been linked to posterior polar cataract formation. That D109 and R120 interact during dimerization of alpha-B crystallin again highlights that alpha-B crystallin may play an important role in posterior polar cataract development in some families. Because the understanding of posterior polar cataract, an autosomal dominant condition, is continually expanding, genetic counseling for the parents remains very important. A posterior polar cataract has an autosomal dominant inheritance pattern. However, it has also been noted as a result of gene mutation. The proximal cause of the abnormality is expressed as an abnormality in lens development, specifically in the lens fibers that fail to develop normally and form an opacity close to and sometimes adherent to the posterior capsule. Maldevelopment of the lens fibers produces an opacity composed of disorganized, misshapen, and malformed lens fibers and vacuoles in the region of the posterior polar capsule. At times, this discoid opacity can actually adhere to the posterior capsule. The remainder of the lens can appear normal, and the pathology is limited to the specific area mentioned above. The genomic etiology has been localized to the chromosomes mentioned above. Its challenge as a surgical problem remains significant. Posterior polar cataract is easily seen and often clearly delineated. In its early stages, it can be seen interfering with the normal light reflex. Fully formed, it presents as a dense, circular plaque in the central posterior part of the lens. It can be surrounded by vacuoles and smaller areas of degenerated lens material. Often, the only benefit to the surgeon is that the defect is so clearly visible. This entity is rare and can be seen to progress from its initial discovery. Surgical therapy is indicated once visual acuity is affected. Further, because of its mode of inheritance, ophthalmic examinations should be scheduled for family members. Once visual acuity is diminished, amblyopia can develop and cataract removal is indicated. Since this type of lens opacity usually occurs directly in the visual axis, it does diminish vision more rapidly as compared to lens opacities that are located more peripherally. Moreover, since posterior polar cataracts can occur in a younger age group, the possibility of amblyopia must be considered. Lack of improved visual acuity after phacoemulsification is most common when the cataracts are unilateral, indicating amblyopia as the likely cause. The case for early intervention is made on the basis that visual acuity impairment can lead to amblyopia. The Lens Opacities Classification System (LOCS) that indicates the significance of the lens opacity is not clearly applicable here. A separate posterior polar cataract classification system has yet to be formally introduced. The indication for posterior capsular cataract removal is often only a matter of time. Certainly, a visual acuity that is worse than 20/40 is a valid indication. In addition, de Jong et al suggest that elevated straylight may be an indication for cataract surgery independent of visual acuity. While visual acuity may be fairly well preserved, straylight can be very bothersome to patients, and straylight levels decrease after cataract surgery in patients with posterior polar cataracts. While the patient can opt for surgery when the vision impairs daily activity or symptoms such a straylight become sufficiently bothersome, it is the surgeon's judgment that should determine the time of intervention. Since posterior polar cataracts can present in the first several months of life, surgical intervention is indicated in the presence of a visually significant opacity. The suspicion of amblyopia predisposes to very early removal of the lens opacity. This is especially true if an unexplained decrease in visual acuity occurs without a concurrent change in the posterior polar cataract. A posterior polar cataract consists of dysplastic lens fibers, which, in their migration posteriorly from the lens equator, exhibit progressive lens opacity with the formation of a characteristic discoid posterior polar plaquelike cataract. Histology has shown that posterior polar cataracts consist of lens fibers that have developed abnormally. Further, the lens fibrils have degenerated and, in some cases, are directly attached to the posterior capsule. Often, the posterior polar opacified plaque is surrounded by a less distinct area of fibrillar degeneration as well as vacuoles filled with liquefied material. The current literature points to a genomic cause of this entity. Several chromosomal abnormalities, the majority of which appear to exhibit an autosomal dominant inheritance pattern, are present in a familial distribution in posterior polar cataract cases. Because these cataracts appear to occur in familial groups, the focus has narrowed in on several specific chromosomes. These genomic aspects are also discussed in Etiology. Future work may shed light on the more detailed genomic defect of this subtype of lens opacity. Contraindications include any concurrent medical condition that precludes cataract surgery. A complete ocular history and a family history must be obtained. After a full ophthalmic examination, any concurrent ocular pathology must be stabilized prior to surgical intervention. Ocular conditions, such as retinal detachment or glaucoma, as well as infections of any type must be treated. Once the patient is stabilized, surgery can then proceed. The surgeon should use the same criteria to determine if surgery is appropriate in a posterior polar cataract case as that for a routine case. Bucklers. Klin Monatsbl Augenheilkd. 1935. 94:289. Nordmann J. Biologie du cristallin. Paris: Masson;. 1954. Summers KM, Withers SJ, Gole GA, Piras S, Taylor PJ. Anterior segment mesenchymal dysgenesis in a large Australian family is associated with the recurrent 17 bp duplication in PITX3. Mol Vis. 2008. 14:2010-5. [Medline]. [Full Text]. Vogt G, Horvath-Puho E, Czeizel E. [A population-based case-control study of isolated congenital cataract]. Orv Hetil. 2006 Jun 11. 147(23):1077-84. [Medline]. Mistr SK, Trivedi RH, Wilson ME. Preoperative considerations and outcomes of primary intraocular lens implantation in children with posterior polar and posterior lentiglobus cataract. J AAPOS. 2008 Feb. 12 (1):58-61. [Medline]. Leibowitz HM, Krueger DE, Maunder LR, et al. The Framingham Eye Study monograph: An ophthalmological and epidemiological study of cataract, glaucoma, diabetic retinopathy, macular degeneration, and visual acuity in a general population of 2631 adults, 1973-1975. Surv Ophthalmol. 1980 May-Jun. 24:335-610. [Medline]. Taylor HR, West SK, Rosenthal FS, et al. Effect of ultraviolet radiation on cataract formation. N Engl J Med. 1988 Dec 1. 319(22):1429-33. [Medline]. Hiller R, Sperduto RD, Ederer F. Epidemiologic associations with cataract in the 1971-1972 National Health and Nutrition Examination Survey. Am J Epidemiol. 1983 Aug. 118(2):239-49. [Medline]. Bidinost C, Matsumoto M, Chung D, et al. Heterozygous and homozygous mutations in PITX3 in a large Lebanese family with posterior polar cataracts and neurodevelopmental abnormalities. Invest Ophthalmol Vis Sci. 2006 Apr. 47(4):1274-80. [Medline]. Zhang T, Hua R, Xiao W, et al. Mutations of the EPHA2 receptor tyrosine kinase gene cause autosomal dominant congenital cataract. Hum Mutat. 2009 May. 30(5):E603-11. [Medline]. Addison PK, Berry V, Ionides AC, Francis PJ, Bhattacharya SS, Moore AT. Posterior polar cataract is the predominant consequence of a recurrent mutation in the PITX3 gene. Br J Ophthalmol. 2005 Feb. 89(2):138-41. [Medline]. Burdon KP, McKay JD, Wirth MG, et al. The PITX3 gene in posterior polar congenital cataract in Australia. Mol Vis. 2006 Apr 18. 12:367-71. [Medline]. Berry V, Francis PJ, Prescott Q, Waseem NH, Moore AT, Bhattacharya SS. A novel 1-bp deletion in PITX3 causing congenital posterior polar cataract. Mol Vis. 2011. 17:1249-53. [Medline]. [Full Text]. Zhu P, Li W, Ni M, Zhang C, Liu S, Wu Q, et al. The P20R mutation of αB-crystallin diminishes its anti-apoptotic activity in human lens epithelial cells. Biochem Biophys Res Commun. 2017 Jan 29. 483 (1):463-467. [Medline]. Xia XY, Wu QY, An LM, Li WW, Li N, Li TF, et al. A novel P20R mutation in the alpha-B crystallin gene causes autosomal dominant congenital posterior polar cataracts in a Chinese family. BMC Ophthalmol. 2014 Sep 8. 14:108. [Medline]. Sacconi S, Féasson L, Antoine JC, Pécheux C, Bernard R, Cobo AM, et al. A novel CRYAB mutation resulting in multisystemic disease. Neuromuscul Disord. 2012 Jan. 22 (1):66-72. [Medline]. Stanić R, Bućan K, Stanić-Jurasin K, Kovacić Z. Phacoemulsification in eyes with posterior polar cataract. Acta Clin Croat. 2012 Mar. 51 (1):55-8. [Medline]. de Jong B, van der Meulen IJ, Lapid-Gortzak R, van den Berg TJ. Straylight in posterior polar cataract. J Cataract Refract Surg. 2019 Jan. 45 (1):72-75. [Medline]. Chan TC, Li EY, Yau JC. Application of anterior segment optical coherence tomography to identify eyes with posterior polar cataract at high risk for posterior capsule rupture. J Cataract Refract Surg. 2014 Dec. 40(12):2076-81. [Medline]. Kymionis GD, Diakonis VF, Liakopoulos DA, Tsoulnaras KI, Klados NE, Pallikaris IG. Anterior segment optical coherence tomography for demonstrating posterior capsular rent in posterior polar cataract. Clin Ophthalmol. 2014. 8:215-7. [Medline]. [Full Text]. Pavan Kumar G, Krishnamurthy P, Nath M, Baskaran P, Janani M, Venkatesh R. Can preoperative anterior segment optical coherence tomography predict posterior capsule rupture during phacoemulsification in patients with posterior polar cataract?. J Cataract Refract Surg. 2018 Dec. 44 (12):1441-1445. [Medline]. Forster JE, Abadi RV, Muldoon M, Lloyd IC. Grading infantile cataracts. Ophthalmic Physiol Opt. 2006 Jul. 26(4):372-9. [Medline]. Kronenberg A, Blei F, Ceisler E, Steele M, Furlan L, Kodsi S. Ocular and systemic manifestations of PHACES (Posterior fossa malformations, Hemangiomas, Arterial anomalies, Cardiac defects and coarctation of the Aorta, Eye abnormalities, and Sternal abnormalities or ventral developmental defects) syndrome. J AAPOS. 2005 Apr. 9(2):169-73. [Medline]. Das S, Khanna R, Mohiuddin SM, Ramamurthy B. Surgical and visual outcomes for posterior polar cataract. Br J Ophthalmol. 2008 Nov. 92(11):1476-8. [Medline]. Lim Z, Goh J. Modified epinucleus pre-chop for the dense posterior polar cataract. Ophthalmic Surg Lasers Imaging. 2008 Mar-Apr. 39(2):171-3. [Medline]. Mistr SK, Trivedi RH, Wilson ME. Preoperative considerations and outcomes of primary intraocular lens implantation in children with posterior polar and posterior lentiglobus cataract. J AAPOS. 2008 Feb. 12(1):58-61. [Medline]. Vajpayee RB, Sinha R, Singhvi A, Sharma N, Titiyal JS, Tandon R. Layer by layer' phacoemulsification in posterior polar cataract with pre-existing posterior capsular rent. Eye (Lond). 2008 Aug. 22(8):1008-10. [Medline]. Vasavada AR, Vasavada V, Vasavada S, Srivastava S, Vasavada V, Raj S. Femtodelineation to enhance safety in posterior polar cataracts. J Cataract Refract Surg. 2015 Apr. 41 (4):702-7. [Medline]. Titiyal JS, Kaur M, Sharma N. Femtosecond Laser-assisted Cataract Surgery Technique to Enhance Safety in Posterior Polar Cataract. J Refract Surg. 2015 Dec. 31 (12):826-8. [Medline]. Stanic R, Bucan K, Stanic-Jurasin K, Kovacic Z. Phacoemulsification in eyes with posterior polar cataract. Acta Clin Croat. 2012 Mar. 51(1):55-8. [Medline]. Hoffer KJ, McFarland JE. Intracameral subcapsular fluorescein staining for improved visualization during capsulorhexis in mature cataracts. J Cataract Refract Surg. 1993 Jul. 19(4):566. [Medline]. Chylack LT Jr, Wolfe JK, Singer DM, et al. The Lens Opacities Classification System III. The Longitudinal Study of Cataract Study Group. Arch Ophthalmol. 1993 Jun. 111(6):831-6. [Medline]. Eshaghian J, Streeten BW. Human posterior subcapsular cataract. An ultrastructural study of the posteriorly migrating cells. Arch Ophthalmol. 1980 Jan. 98(1):134-43. [Medline]. Fine IH. Cortical cleaving hydrodissection. J Cataract Refract Surg. 1992 Sep. 18(5):508-12. [Medline]. Hayashi K, Hayashi H, Nakao F, Hayashi F. Outcomes of surgery for posterior polar cataract. J Cataract Refract Surg. 2003 Jan. 29(1):45-9. [Medline]. Nagata M, Matsuura H, Fujinaga Y. Ultrastructure of posterior subcapsular cataract in human lens. Ophthalmic Res. 1986. 18(3):180-4. [Medline]. Osher RH, Yu BC, Koch DD. Posterior polar cataracts: a predisposition to intraoperative posterior capsular rupture. J Cataract Refract Surg. 1990 Mar. 16(2):157-62. [Medline]. Pandey SK, Werner L, Escobar-Gomez M, Werner LP, Apple DJ. Dye-enhanced cataract surgery. Part 3: posterior capsule staining to learn posterior continuous curvilinear capsulorhexis. J Cataract Refract Surg. 2000 Jul. 26(7):1066-71. [Medline]. Streeten BW, Eshaghian J. Human posterior subcapsular cataract. A gross and flat preparation study. Arch Ophthalmol. 1978 Sep. 96(9):1653-8. [Medline]. West SK, Rosenthal F, Newland HS, Taylor HR. Use of photographic techniques to grade nuclear cataracts. Invest Ophthalmol Vis Sci. 1988 Jan. 29(1):73-7. [Medline]. Removal of the nucleus and much of the cortex has been completed with the aid of hydrodissection. Almost all of the posterior cortical opacity has also been aspirated. Only indirect irrigation and aspiration was used. Hydrodelineation has been avoided. There appears to be a ringlike remnant of the opacity that may have some adherence to the capsule. Removal of the nucleus and much of the cortex has been completed. Highly dilute fluorescein dye has been instilled to stain the remaining epinucleus but especially the remaining ringlike opacity. The capsule is still intact since the stain is limited to the anterior chamber. This aids in careful cortical aspiration without damage to the intact posterior capsule. Aspiration of the subincisional cortex is shown. The dye in the remaining ringlike edge of the cataract, at the 10-o'clock position, appears to show a small strand still adhering in the direction of the posterior capsule. A defect in the capsule has been avoided up to this point. After careful cortical aspiration, a posterior chamber lens is shown. The capsule has remained intact.